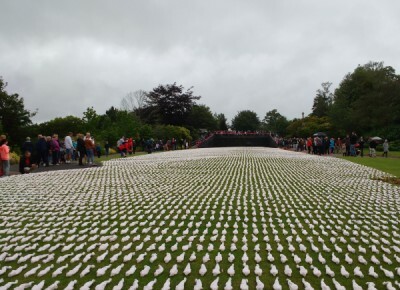 Exeter’s 19240 Shrouds of the Somme was an arts project and display launched in Northernhay Gardens, Exeter on the 1st July 2016 to commemorate those who died on the first day of battle 100 years ago. 19,240 12-inch figures were created for this poignant display to represent each of the British soldiers who lost their lives during the first four hours of the Battle of the Somme. These shrouded figurines were on view and laid out perfectly on the green lawns of Northernhay Gardens in front of the war memorial for visitors to view. The artist at the centre of this project was Rob Heard from Somerset who individually hand-stitched the shroud of each of the figures.